Taka here with another review- second in a row; not too shabby! I was honestly surprised when I received this single in the mail… but I was overjoyed! I adore Sono’s voice and just the overall dynamic composition style that is Matenrou Opera. 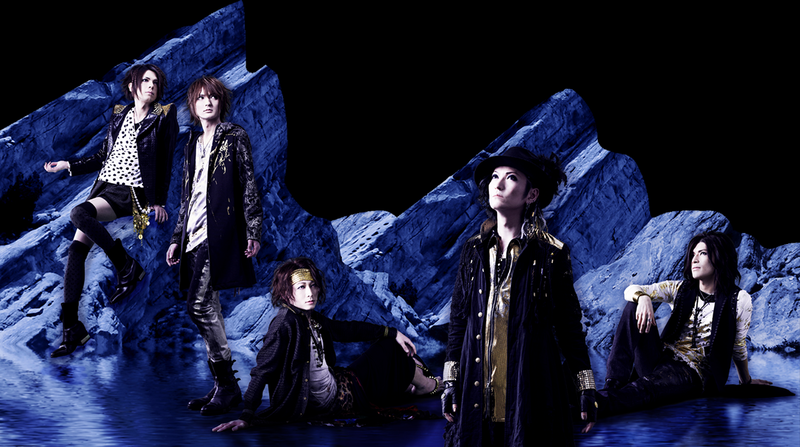 On April 8, Matenrou Opera released their maxi-single, ether. The first thing I HAVE to note about this single is how cool the jacket is. The lyric booklet is actually sitting in the little holster that is the band (as you see above) and there is a moon that also separates and you slide in behind them, building it as a 3 layer pop-up book in a way. Not to mention, the CD is kept iridescent with white printing over the top. Before I diagnose each song individually, I have to say I unfortunately was unable to find translated lyrics in order to discuss the lyrical content. If you happen to find any, feel free to tell me so I can look into them! Also, you cannot necessarily judge this single as a whole, since the style changes from track to track. I feel this single has a little something for all of your tastes. A very ethereal start to this single, which seems obvious considering the title is ‘ether’. The beginning draws you in with Sono’s beautifully echoed voice accompanied with violin and chimes. Then it gets down to business with a slightly crunchy, but still majestic, riff by the rest of the band. It picks up nicely into a symphonic rock pulse that Matenrou is no stranger to. The phrase “hikari no mukou e/to the other side of the light” is repeated throughout the song in the same echo style; as if Sono’s voice wasn’t angelic enough, now he is literally beckoning the listener in a heavenly call. The whole song has the ebb and flow of a tide, with slight crunchy interruptions so you don’t actually get carried away. The guitar solo, which bleeds into a similar violin and synth bridge, Anzi and Ayame do not disappoint and provide fantastic support for yet another angelic style change. There is a majestic build with the same lyrical call (“hikari no mukou e”) into the final verse of the song. Throughout, it has many falling actions with notes- Anzi, Ayame, and even Yo going at it while Yuu keeps pace. It fades out with Sono on a sustained note and the echo call continuing in silence for a bit, leaving the listening unsure of when it officially ends. Then suddenly you’re on to the next track. While in ether Ayame’s synth isn’t that noticeable, it makes its presence known here, pulsing with what could feel like a sci-fi soundtrack riff right in the beginning. This song is pure classic rock to me. I feel like I’m listening to a modernized hair band… oh wait, I am! Well, maybe not to the degree as say Aerosmith, but you catch what I’m saying. In short, I’d love to hear this played live. It has such a stadium presence that would be sure to be the most fun song of the night. I’m a sucker for a good synth and honestly, Ayame has stolen my heart in this song, Sono’s vocals being an easy second. In the chorus especially, Sono gets a bit rough with his voice, giving some bite to that angelic tone. Mid-song (at about 2:35), there is a dramatic ‘downfall’ in tuning and tone before it is picked back up by Ayame’s synth and Anzi begins to shred. The bridge has an easy, steady headbang feel to it, thanks to the build from Yuu, before Sono just sustains the most gorgeous note that I didn’t want to end. But, it does and leads to the final chorus before the same dramatic downfall occurs once more, going more and more out of tune until the song ends in a slow death crawl. This is by far my favourite track on this single! Now we enter the heavy rock anthem song! It may be closely related to “Round and Round” in musical style, but it is still so different. It starts out with an even rougher Sono and then Anzi brings it all in with a cool riff. Sono seems a bit more sensual in the way he is singing this time around. Throughout the verses, it’s only Sono, Yo, and Yuu with some occasional interjections by Ayame and Anzi that eventually build into the pre-chorus. It keeps this pattern and feel up until about 2:09 where the bridge brings forth some layered vocal tracks that go by so fast and suddenly you’re back in another pre-chorus. This section is followed by a wonderfully executed (and super jazzy) back-and-forth between Anzi and Ayame with Yo and Yuu backing them up the entire time until finally, the group can’t take it anymore and they bust into a riff all together. It ends with a sudden blip of sound, ending just as harsh as it began. Now, this song is my least favourite on the single, but it is far from horrible. For me, in looking at the other two, it just doesn’t compare in what I prefer. And that is Matenrou Opera’s ether. I give it an A! While “ari no koushin” may be ranked 3rd out of my personal tastes on this single, I still found it enjoyable and hardly anything to take it down to a B. But maybe that’s also because “Round and Round” is a near A+++ rating for me. Either way: It’s a wonderful maxi-single that definitely deserves a listen! Especially if you love Sono’s vocals and some good synthesizer work like I do.